Worcester, Mass. – As fall sports seasons get under way and concerns related to concussions in contact sports continue to grow, a Worcester Polytechnic Institute (WPI) biomedical engineering professor is developing better tools to understand the mechanics of traumatic brain injuries in athletes. Ji is developing a sophisticated head injury computer model to produce a strain map as part of a four-year $1.5 million NIH grant, titled "Accumulated white matter fiber strain from repetitive head impacts in contact sports." Co-principal investigators include colleagues from Dartmouth College, Indiana University School of Medicine, and medical device developer Simbex. In a separate two-year, $461,545 NIH grant, titled "Model-based cumulative analysis of on-field head impacts in contact sports," Ji is working to make the model simulation in real time. "Typically it would take hours to produce a detailed strain map for each impact to determine if someone has a concussion," said Ji. "But we are developing a model simulation in real time." Ji envisions that, in the future, an athlete on the field could be wearing protective gear, such as a helmet or mouthguard, equipped with an impact sensor. When an athlete's head is struck, the sensor would record the acceleration, which would provide input to the computer model. "But the computational cost is now too high for real-world applications," Ji said, "and that's why we are also developing a real-time simulation technique." Ji added that many current concussion studies are looking at acceleration magnitudes, much like a "hit count" – the number of times an athlete's head has been hit – rather than considering how many times a specific brain region experiences a certain level of strain and deformation, which is likely more related to the extent of the actual injury. Ji's lab is looking at the role such repeated straining plays in the severity of concussions. 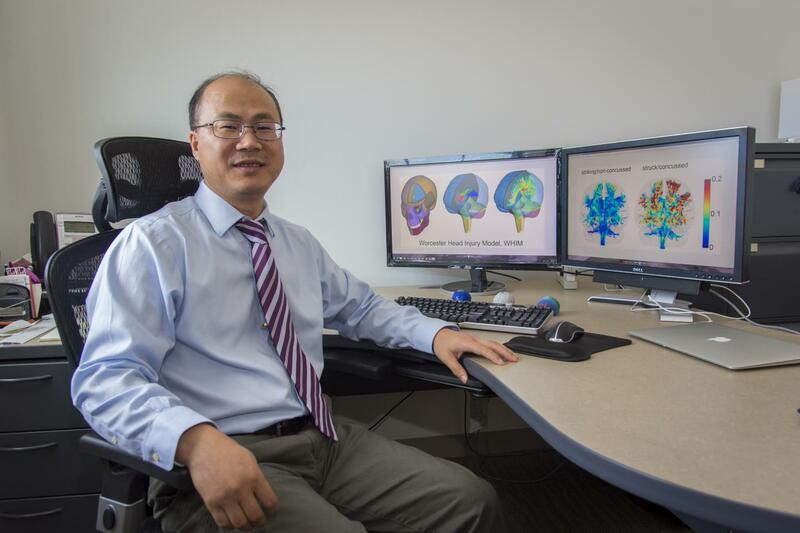 In a recently published paper in Biomechanics and Modeling in Mechanobiology, Ji and his research associates found that, in addition to the findings about deep white matter, a rigorous cross-validation of injury prediction performance has been lacking in brain injury studies. They proposed a general framework to address this issue in future studies. "I am very encouraged by the research and think that we can make an impact in this crucial health area," Ji says. "My research team understands just how important it is to advance concussion research for athletes of both genders and of all ages."